Home automation used to be the domain of the high end builders market only, but not any more. With the innovation of new technologies and greater competition with suppliers and manufactures demand has never been greater. The innovation of Smart Phones and Tables now allows for less wiring and hardware. You are able to use smart apps , wireless technology and bluetooth. The type of automation is endless and gets more exciting every day. Just think, its 40 degrees you are at work, you log onto you home automation close the blinds, turn on the air conditioner , reprogram the watering system, and turn on your favourite music. When you get home the house is cool the plants are watered and you can take the next 30 min to relax unwind with a cool drink while listing to your favourite crooner. You have left the iron on and also put the alarm on. You can call your neighbour turn off your alarm from your phone unlock the door and lock up when the iron has been turned off. 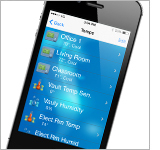 If you would like more information on home automation just shoot me a email. Posted on October 26, 2014 October 26, 2014 by Steve Acorn	Bookmark the permalink.